Description: Same case senario with this MILW unit. Description: A track maintainer gives Milwaukee Road 740 a highball as it heads from the coach yard to the station, with another passenger train. 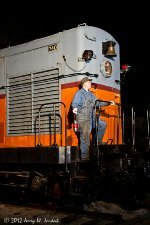 Photo from the first ever "Night Photo Session" at the Mad River & NKP Railroad Museum. Description: From a night photo shoot at the Mad River & NKP Museum. Description: A pretty neat little switcher with a gorgeous paint job - I love the bell and marker lights on the end of the long hood.